Rangely volleyball players Torie Slagle (14) and Dakota Kenney celebrate a point during Friday’s rivalry match against Meeker. 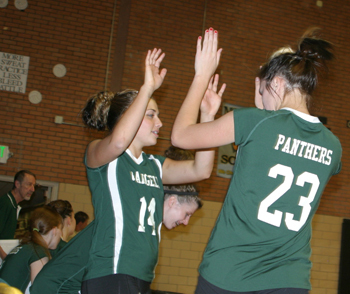 The Lady Panthers won in four games. RANGELY I It was a big week for the Lady Panthers. Their head coach, Jimmie Mergleman, delivered a baby boy the morning of Oct 13. Then there was the always-intense matchup against county rival Meeker. In between, there was a tough loss to Vail Christian, the league’s only unbeaten team. Rangely’s volleyball team lost its home match to Vail Christian the night of Oct. 13. The Lady Panthers played better Friday, when they traveled to Meeker, which, as always, was accompanied by a raucous atmosphere. The Lady Panthers won the first two sets against the host Lady Cowboys, lost the third set, and then won the fourth, to claim the match. After losing to Vail Christian — its second loss of the season — Rangely was fired up to play Meeker. “The girls practiced hard in preparation for the match,” Rohn said. In the first two sets against Meeker, Rangely won, 25-16 and 25-22. The Lady Panthers lost the third set, 22-25, but then prevailed in the fourth and final set, 25-20. With the regular season winding down — the Lady Panthers host West Grand in the finale Friday — Rohn said the team is peaking at the right time. District play is the weekend of Halloween, when Rangely will return to Meeker, which will host the tournament.